Occlusion refers to the alignment of teeth and the way that the upper and lower teeth fit together (bite). The upper teeth should fit slightly over the lower teeth. 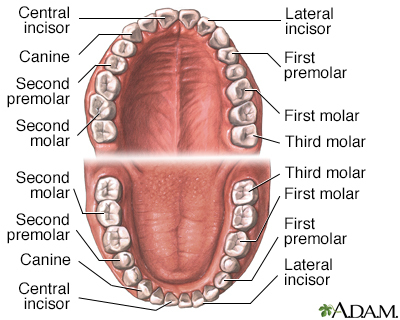 The points of the molars should fit the grooves of the opposite molar. The upper teeth keep you from biting your cheeks and lips, and your lower teeth protect your tongue. Malocclusion is most often hereditary. This means it is passed down through families. 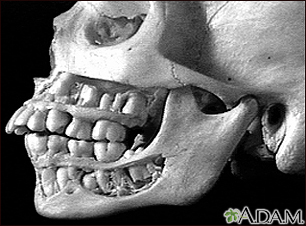 It may be caused by a difference between the size of the upper and lower jaws or between the jaw and tooth size. It causes tooth overcrowding or abnormal bite patterns. The shape of the jaws or birth defects such as cleft lip and palate may also be reasons for malocclusion. Class 3 malocclusion, called prognathism or underbite, occurs when the lower jaw protrudes or juts forward, causing the lower jaw and teeth to overlap the upper jaw and teeth. Most problems with teeth alignment are discovered by a dentist during a routine exam. Your dentist may pull your cheek outward and ask you to bite down to check how well your back teeth come together. If there is any problem, your dentist may refer you to an orthodontist for diagnosis and treatment. You may need to have dental x-rays, head or skull x-rays, or facial x-rays. Diagnostic models of the teeth are often needed to diagnose the problem. A skull x-ray is a picture of the bones surrounding the brain, including the facial bones, the nose, and the sinuses. Very few people have perfect teeth alignment. However, most problems are minor and do not require treatment. Malocclusion is the most common reason for referral to an orthodontist. Make teeth easier to clean and decrease risk of tooth decay and periodontal diseases (gingivitis or periodontitis). Periodontitis is inflammation and infection of the ligaments and bones that support the teeth. Eliminate strain on the teeth, jaws, and muscles. This lessens the risk of breaking a tooth and may reduce symptoms of temporomandibular joint disorders (TMJ). Braces or other appliances: Metal bands are placed around some teeth, or metal, ceramic, or plastic bonds are attached to the surface of the teeth. Wires or springs apply force to the teeth. Clear braces (aligners) without wires may be used in some people. Removal of one or more teeth: This may be needed if overcrowding is part of the problem. Repair of rough or irregular teeth: Teeth may be adjusted down, reshaped, and bonded or capped. Misshapen restorations and dental appliances should be repaired. Surgery: Surgical reshaping to lengthen or shorten the jaw is needed in rare cases. Wires, plates, or screws may be used to stabilize the jaw bone. It is important to brush and floss your teeth every day and have regular visits to a general dentist. Plaque builds up on braces and may permanently mark teeth or cause tooth decay if it is not properly removed. You will need a retainer to stabilize your teeth after having braces. Problems with teeth alignment are easier, quicker, and less expensive to treat when they are corrected early. Treatment works best in children and adolescents because their bones are still soft and teeth are moved more easily. Treatment may last 6 months to 2 or more years. The time will depend on how much correction is needed. Treatment of orthodontic disorders in adults is often successful, but may require longer use of braces or other devices. Call your dentist if toothache, mouth pain, or other new symptoms develop during orthodontic treatment. Many types of malocclusion are not preventable. It may be necessary to control habits such as thumb sucking or tongue thrusting (pushing your tongue forward between your upper and lower teeth). Finding and treating the problem early allows for quicker results and more success. Dean JA. Managing the developing occlusion. In: Dean JA, ed. McDonald and Avery's Dentistry for the Child and Adolescent. 10th ed. St Louis, MO: Elsevier; 2016:chap 22. Tinanoff N. Malocclusion. In: Kliegman RM, Stanton BF, St. Geme JW, Schor NF, eds. Nelson Textbook of Pediatrics. 20th ed. Philadelphia, PA: Elsevier; 2016:chap 309. 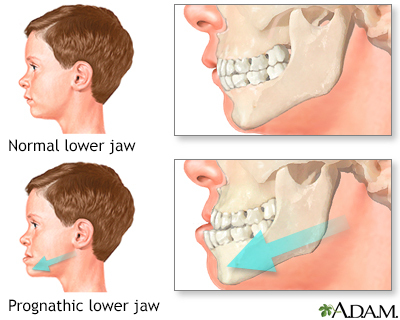 Prognathism is a descriptive term for a jaw (upper or lower) that protrudes forward beyond the plane of the face. This is a picture of normal teeth with an overjet. Some bone has been cut away to reveal the roots of the teeth. Occlusion refers to the alignment of teeth and the way that the upper and lower teeth fit together (bite). Malocclusion is the most common reason for referral to an orthodontist. 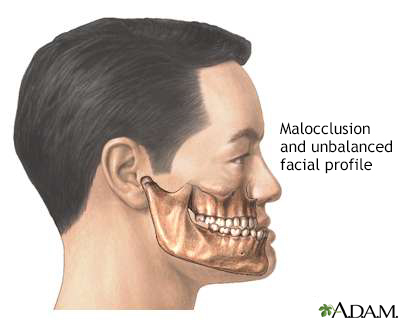 Most malocclusion is mild enough not to require treatment. If a severe misalignment is present, orthodontics and/or oral surgery may be required.